Move-In Day, months in the planning and the object of more strategy than a Pentagon briefing, was pronounced a success Thursday by the front-line generals who oversaw its military-like precision. Luggage Luggers prepare to lug luggage. GCU students, faculty and staff were the gray-shirted troops that efficiently and enthusiastically welcomed new students and their families to campus — no small task amid an assortment of construction projects on a sweltering August day. “Because of the volunteers and the student leaders and the strategic plan, it was fantastic,” said John-Paul Reiger, GCU’s student development director. The day’s only bottleneck occurred around noon and lasted for about an hour, resulting in the closure of 31st Avenue to incoming traffic. Students and their families entered campus via 32nd Avenue thereafter. 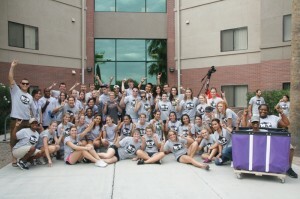 Students living in Hegel Hall and the North Rim Apartments were assigned to a morning move-in. Those in the larger residence halls — Canyon Hall and the new Prescott Hall — were instructed to arrive after noon. That was only one of the differences from Move-In 2010, when a long line extended from the Student Union down the Promenade and traffic was backed up all the way to Interstate 17. Star Rez, a new computer program, has made real-time recordkeeping a breeze for campus housing, according to James Rogers, a resident director at Prescott Hall. And the Student Recreation Center, which didn’t open until last October, accommodated academic and financial counselors in a spacious, stress-free setting. Thunder Alley, the much-anticipated food court adjacent to the Rec Center, was open for business Thursday, offering Mexican food at Cobrizo’s and Asian cuisine at Mein Bowl. “There’s more of a university feel now,” said senior Lindsey Scott of north Phoenix, a commuter student who was visiting her friend Sarah Fladager, a Life Leader in Prescott Hall. 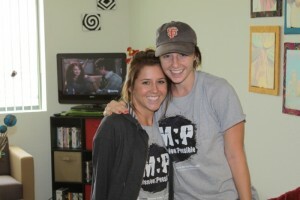 Sarah Fladager and Lindsey Scott. Fladager’s room on Prescott’s fifth floor faces west and is a prime sunset-viewing location. All day, the new residence hall received raves from students for its many amenities and its spectacular views of campus and downtown. That was a source of pride for Butch Glispie, the owner of Pono Construction of Glendale, which built the North Rim Apartments in 1986 and hasn’t stopped putting up campus residences ever since. “This is a little like giving up your kid,” Glispie said as students streamed into Prescott. “All I’ve heard are positive comments. That’s what we work for. It’s humbling. On the lane along the north side of Prescott, GCU’s new head baseball coach, Andy Stankiewicz, was enjoying his first Move-In while several of his players were pitching in as Luggage Luggers. “It’s great that the whole school helps out,” Stankiewicz said. “Hopefully this shows that we really care about our students. Killian Larson, who transferred to GCU from Dominican University in northern California and will be eligible to play basketball in 2012-13, is among those blown away. He said Move-In is unique. “There’s a camaraderie to this,” he said. “At my old school, you did this by yourself. Everyone here has a goal or a dream, and it gets done. I’ve noticed that with the facilities, and it’s kind of surreal. Lynn Bickle, decked out in GCU gear, insisted she could take the temperature of 110-plus. She routed vehicles from the east lot to Prescott and Canyon halls with an enthusiasm that defied the withering conditions. She was sweaty, tired and loving it. Dr. Beggs provides fruit snack nutrition to Dr. Wooden. Among those lending a hand at Prescott were President Kathy Player, Provost Cheri St. Arnauld and Deans Mark Wooden and Anne McNamara. “It’s the hottest fun you can have in the daylight,” quipped Dr. James Beggs of the College of Arts and Sciences as he dispensed fruit snacks in the Prescott lobby. He was clad in purple hospital scrubs for the occasion.